Adenium Obesum is commonly known as ‘The Desert Rose’ and indeed they do grow in dry desert areas. They are native to Eastern Africa and Northern Arabia. The flowers are attractive and indeed create a rosy picture, however they are not related to roses as such. Adeniums require full sun for proper care but can be grown indoors if they receive full light near a window. When growing in pots try unglazed pots as these plants like to dry out between waterings and terracotta pots are excellent for this. 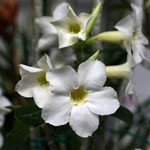 Adenium make an interesting bonsai specimen with a fascinating swollen trunk and attractive flowers. A well drained potting mix is essential for adeniums to thrive. Check out other species of adenium such as A. swazicum, A. somalense, A. arabicum, A. crispum and A. multiflorum. Also known as the ‘Fortune Tree’, in Feng Shui the placement of Adenium obesum on the left side of your front door is said to bring good fortune. And when the ‘Fortune tree’ is flowering this is a particularly lucky period. Although looked at a ‘bonsai’ because of the bulbous base, this is a natural growth habit of Adeniums. Adeniums are available in a number of varieties including both single petal and multi petal types. 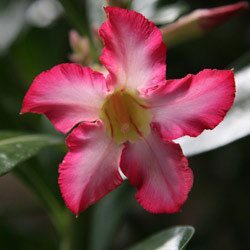 Nurseries have been hybridising Desert Rose plants for a number of years, with great results. Flowers with striped petals and even coloured edge varieties are becoming available. Grafted varieties are also becoming popular, with the best flowering types being grafted onto rootstocks of other types. Grafted, rather than seed grown not only ensure the flower type and color but also give a more vigorous growth than most seed grown types. 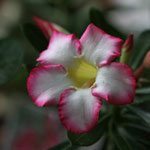 Specialising Adenium, Pachypodium, Euphorbias and other rare exotics. Advanced Adenium "bonsai style" and young plants from imported seeds. 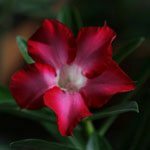 Adenium Obesum is also known as the Desert Rose or ‘Impala Tree’, are available for sale plants from online nurseries. In Feng Shui Adenenium Obesum is also know as the ‘Fortune Tree’, it is said to bring good fortune if placed to the left of a doorway, they are also used in bonsai. A. arabicum, A. boehemianum, A. crispum, A. multiflorum, A. obesum, A. somalense , A. swazicum, A. somalense, A. Thai socotranum and A. socotranum. Adeniums are succulent plants from desert areas, they are very good at surviving on little water. One of the most important aspects is match the amount of water they will receive with the growing medium. The more water, the more free draining the growing medium needs to be. The other aspect of watering is when to water. In active growth Adeniums can take more water, and will put on more growth. During dormancy, they require very little water at all. Adeniums require good bright light, plenty of sun and warmth. HOWEVER, in very hot dry summers they will perform better under shade cloth. The best way to fertilize Adeniums is with weak applications on a regular basis.